Scott G. Brooks was so inspired by people’s frustration with President Obama and the Democrats, he put Glenn Beck in a painting. Actually, Beck wasn’t the sole inspiration for the title figure in ”We The People,” wearing nothing but a strategically placed patriotic ribbon and sporting ”an artificial halo made out of light bulbs.” But Beck ”is a sort of fake messiah distracting people, leading them down the wrong path,” says Brooks. ”And the fact that people are listening to him and others distracting us on television, thinking they have something to offer, is just kind of mind-boggling. 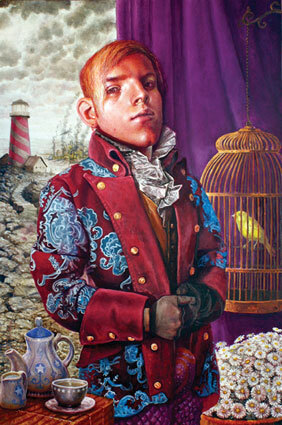 He often adds clowns and circus stuff, or in other ways exaggerates elements for humor’s sake in his figurative illustrations, which have an affinity toward pop-surrealism.